TaholaCloud delivers a complex Business Analytics platform in a more efficient and effective way than traditional approaches. This introductory webinar demonstrates the Business Overview Dashboard and sets the scene for the forthcoming TaholaCloud webinar series. The series will cover a wide range of pre-built dashboards that are available as standard within the solution in much greater depth. 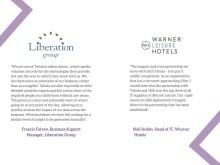 A short introduction to Tahola, the solutions we provide, our integration expertise and a selection of our customers.